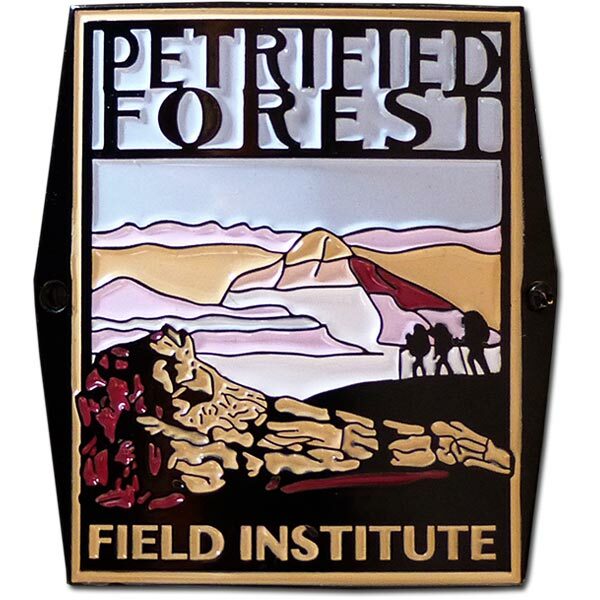 The Petrified Forest Field Institute (PFFI) is a program of the Petrified Forest Museum Association. PFFI is proud to offer guided hiking tours exploring a variety of fun and compelling subjects lead by world class guides and field experts. Join PFFI for geology hikes, paleontology digs, rock art discovery trips, photography workshops and more! Learn more by visiting their site. Come hike Petrified Forest with the Field Institute and show your colors! This beautiful decorative medallion comes with small brass nails to attach it to your hiking stick. It measures 1 1/2″ H x 1 1/4″ W.
Shown larger than actual size. Actual size: 1 1/2″ H x 1 1/4″ W.